Centre for water management offers services like in-house flow product assessment, on site measurement/calibrations, analysis/design and consultancy service related to flow problems especially in water distribution networks, surge etc. 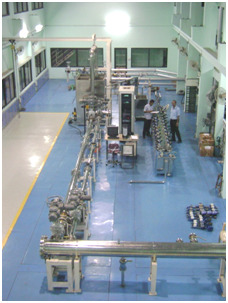 A laboratory, equipped with state of the art equipment, facilitates in-house evaluation of flow products. 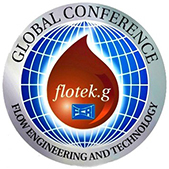 In this facility, accurate measurement of flow in terms of volume is determined by gravimetric system. A flow rate up to 300 cu.m/hr through 150mm pipeline can be achieved in the laboratory with overall uncertainty in volume better than 0.04%. The flow source are, a constant head tank located at a height of about 15m, and a set centrifugal pumps of different capacity. Water passing through the test line is collected in a tank kept on a weighing scale of 300kg or 3000kg. In order to maintain the water quality, stainless steel pipes and fixtures are used. 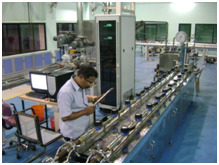 A bank of reference magnetic flow meters are used to set the desired flow through the test line. FCRI is involved in testing of different types and sizes of water meters for the last two decades. 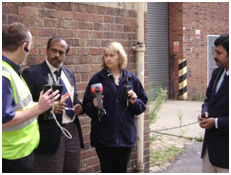 Around 3000 water meters of various sizes are tested every year. 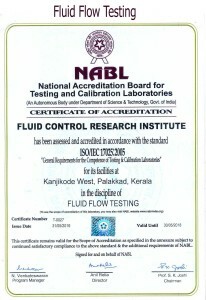 The test facility is accredited by NABL and recognized by Bureau of Indian Standards. Routine tests (initial verification tests) and Pattern approval tests are normally conducted on meters. Routine test of water meters include hydrostatic pressure test, accuracy tests at different flow rates and pressure loss tests. Adequate facilities are available for carrying out various tests specified in different water meter standards like IS, ISO, EEC, OIML etc. Endurance testing of water meters as per IS/ISO are conducted for different water boards in India during their bulk purchase.This has ensured reasonable life for meters in the field and has yielded substantial increase in revenue for water boards. A model approval program (MAP) is launched by FCRI, based on suggestion from several major water boards. This is intended mainly to help the consumers and Water boards for quick purchase of meters, while ensuring the quality of meters. Details of models passed the endurance test will be made available in FCRI website. This is expected to help water boards to verify the models submitted by suppliers and proceed with quick purchase with acceptance tests on randomly sampled meters and applying the prescribed acceptance criteria. Special concessions on testing charges are applicable for water boards carrying out acceptance tests as per national/international norms during their bulk purchase. This quality assurance practice followed by various water boards in India has yielded substantial improvement in their revenue and reduction in UFW. 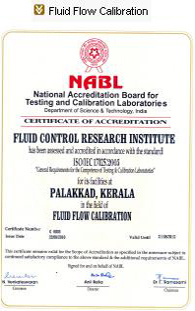 Most of the water boards in India and manufacturers in India and abroad are availing various services offered by FCRI. We encourage the customers to witness the tests along with any person they permit, which makes the testing completely transparent . On-site calibration of flow meters becomes unavoidable when it is difficult to remove the flow meters from the installed location, and simulation of the site conditions in the laboratory becomes impractical. 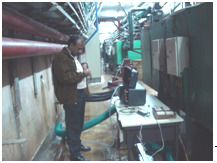 An insertion type turbine flow meter is used for on-site calibrations. The flow velocity is measured by inserting this turbine flow meter in to the pipe section. Velocity measurements are taken at different pre-defined locations along its travel. 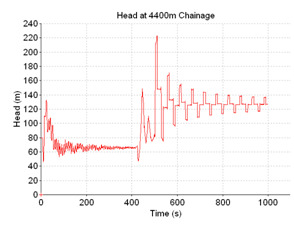 Similar observations are repeated in different diagonals and the discharge is computed. Then the discharge is compared with the readings from the flow meter under calibration. on-site calibration service is provided to various transmission lines of water boards, cooling water circuits of power plants, raw water pumping lines to refineries etc. Using the insertion-type turbine flow meter, calibrations/ discharge measurements were successfully carried out in pipelines upto a diameter of 3000mm. Prototypes of hydro-electric turbines are studied in detail during development stage. The manufacturer is expected to arrive upon the claimed efficiency of the turbine after installation at site. IEC 60041 gives detailed procedure for field efficiency test. Among the different parameters that are to be measured during field efficient testing of hydro-electric turbines, flow measurement is most difficult. But after installation of the turbine it may becomes much difficult or sometimes impossible to measure the discharge through the turbine with reasonable accuracy. The standard gives different methods for discharge measurement.Usually the method of measurement duly considering the site limitations, is agreed between the supplier and purchaser and suitable provisions for discharge measurement are made at site. Measurements are normally carried out in penstocks. But in low head turbines the length of penstocks may not be sufficient to carry out accurate flow measurement. Hence certain unconventional methods need to be adopted. As a third party testing agency specialized in flow measurement, FCRI is involved in several field efficiency tests having varying magnitude (up to 250 MW) and site conditions. Non conventional techniques like tracer dilution technique using Rhodamine WT, Gibson method etc. were also adopted depending on conditions. Like many developing countries, water supplied to consumers is less than the actually required. Hence the supply is intermittent. CWM is equipped with state of the art software and knowledge for analysis, simulation and design of water distribution systems even under low supply situations. It is quite possible to determine the actual supply to each consumer can be determined. CWM had undertaken specific designs for equitable distribution of available water by optimizing the distribution system. Genetic Algorithm is used for this purpose but In some cases, equitable distribution cannot be ensured because of the improper selection of pipe diameters.So far solving such issues, usually pressure dissipating devices like pressure reducing valves, orifice plates, etc. are introduced at proper locations. CWM has developed a simple, cost effective device which can deliver desired flow rate irrespective of the upstream pressures. This is quite suitable for distribution system to achieve equitable supply. Recent accidents showed that high volume long range (HVLR) monitors are required to meet the catastrophic fire and necessary guideline is issued for the same. Hence fire water network needs to be analyzed to ensure adequacy of handling the increased demand due to introduction of HVLRs. 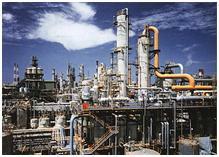 Necessary pumping capacities and storage capacities also need to be ensured for the increased fire demands. 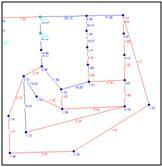 CWM is equipped with softwares for analysis of surge in any type of transmission system. In addition, fast response pressure transducers with continuous monitoring mechanism are also available. These equipments help in measuring the actual pressure change in the system and verify the assumptions considered during design. Consultancy service for different water supply and irrigation departments is being offered for design of economic and safe transmission systems. 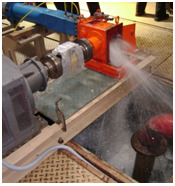 Any flow product should be assessed by proper testing. Manufacturers or the relevant standards specify the operating conditions like flow range, working pressure, pressure loss, accuracy of measurement etc. 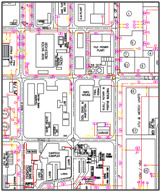 A test set-up should be designed and erected for assessing the flow products. When the number of flow products is less, it is better to depend on a reliable laboratory for testing instead of erecting an exclusive set-up. 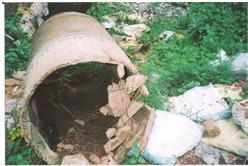 Products like water meters are used millions in the country. As the manufacturers are expected to test each and every flow product they manufacture, they also will require adequate test facility. 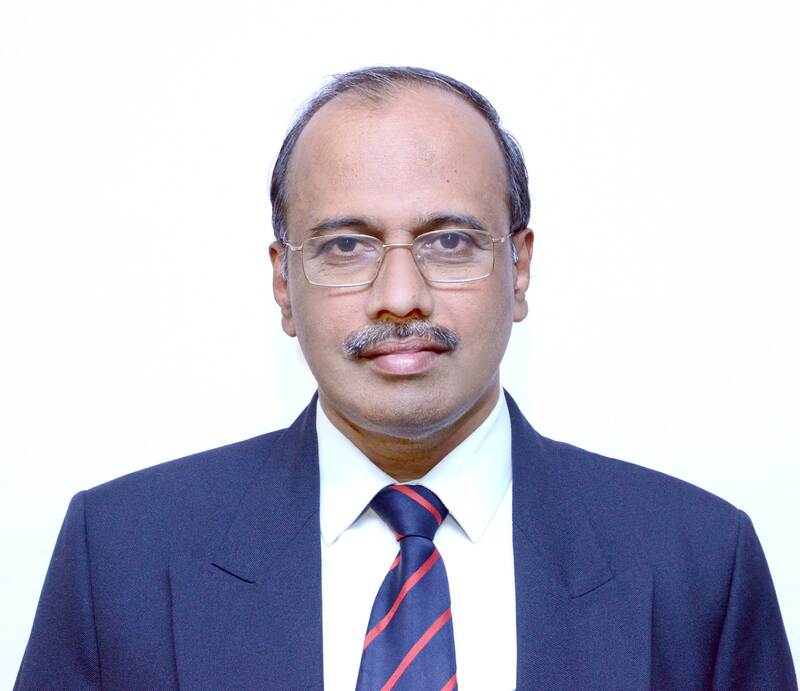 CWM had offered consultancy service for setting up of the test facility for water utilities for testing water meters. Periodic certification of the test facilities is also undertaken. In certain cases, the complete responsibility of design, fabrication, commissioning etc. are also undertaken. 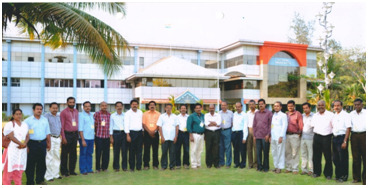 Training for engineers from water boards, manufacturers and consultants. Practicing engineers need proper training in their field. This will help them to refresh the knowledge they have gained from the academic institutes and interact with the experts in the specific field to resolve the problems their day-to-day problems. This is applicable to engineers in service industries, flow product manufacturers and consultants. Recent developments in the industry are also discussed during the training program. CWM is offering one international training program for two months duration and another national program (three days) for the practicing engineers, every year. 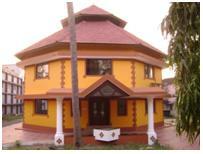 Specific tailor-made programs are also undertaken based on the request from the industry.